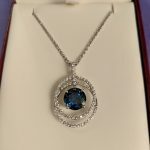 Thanks to an anonymous donor, we are raffling off a 14-karat white gold sapphire and diamond pendant necklace (valued at $5,000) for Mother’s Day. Tickets are 1 for $50 or 3 for $100. The winner will be selected on May 8th. Click here to buy your special raffle tickets and celebrate strong women everywhere.